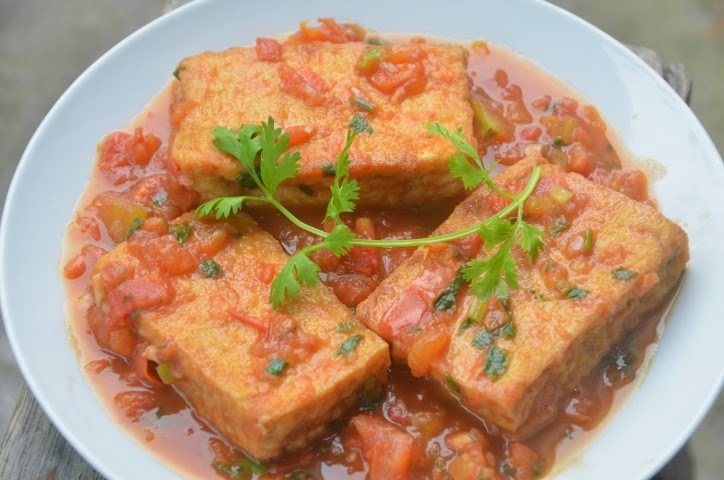 Here is a vegetarian dish that I made for my grandmother. Often times this sauce is made to pour over fried fish. However, I made it with fried tofu. My grandmother ate this and gave me her 'OK' approval. 1) Heat a non-stick pan over medium high heat. Once the pan is hot add 3 tablespoons of oil. 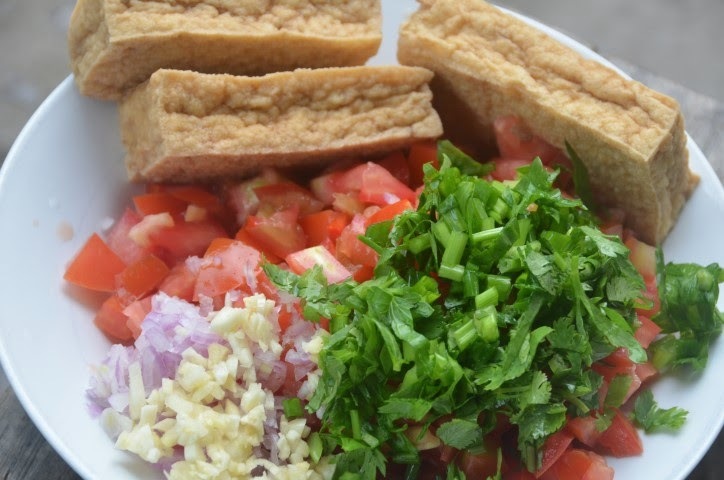 2) Fry the tofu until golden brown (Re-fry until heated through if already fried). Remove from heat. Discard half of the oil. 3) Add garlic and shallots. Saute about 30 seconds to a minute. 4) Add tomatoes, celery, cilantro, scallions, and about 1/2 cup water. May turn heat slightly lower. Cook for about 10 minutes or until the tomato pieces are soft. 5) Season with sugar and soy to taste. May add a little water if the sauce gets too dry. 6) Add the fried tofu back into the pan and cook for about a minute on each side. *If you prefer a thicker (instead of watery as in this recipe) sauce you may add a little mixture of water and cornstarch to the end of step 4. *We had a visit from my 2 beautiful cousins (see above photos). Although you can't really see them! 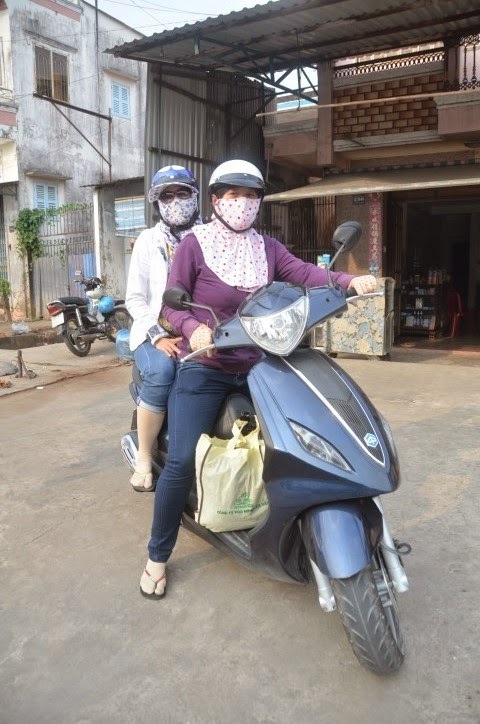 Nowadays this is how people (especially girls/women) travel in Vietnam. 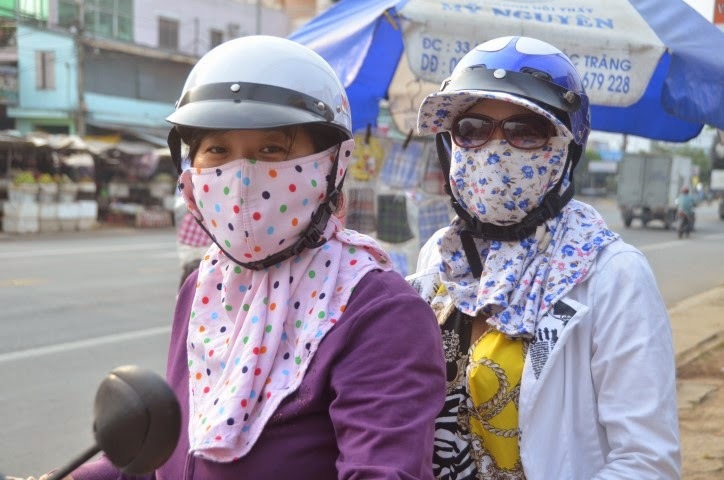 The masks help prevent breathing in the dust. The head to toe covering is to decrease sun exposure even in the tropical heat!